Remove username from youtube plugin properties, reboot xbmc and you're good to go. (2014-02-14, 12:55)kanepa Wrote: [ -> ] I also can not seem to be able to play in 1080p in XBMC youtube, only 720p. What is the reason for this? Vonpire, thanks a lot. It works!!! Although I cannot definitely understand the logic of this. (2014-02-14, 18:09)mgradz Wrote: [ -> ] Vonpire, thanks a lot. It works!!! Although I cannot definitely understand the logic of this. You're authenticating by token so you don't need username. If you put username whenever you try to play a video it will try to authenticate using that username and not token hence it fails, because of the very known "normal" login problem. I thought I would quantify the list loading speed of this addon compared with others on the Raspberry Pi. As you can see this Youtube addon is much slower at showing lists than other addons by as much as three times. The Youtube Channels addon can provide the same channel lists in a fraction of the time. The Vimeo addon is also quite slow. 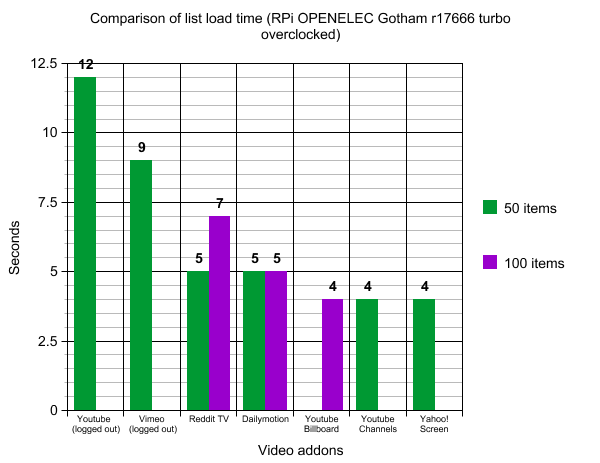 Youtube is arguably the most important XBMC video addon so it is disappointing to see these performance problems. Don't know what you are talking about - i have no authentication problem at all , all my lists favorites and history in place. I'm getting error playing youtube videos from computer (XBMC chrom extention) to XBMC. It's saying one or more items failed to play. Check log for details. that python link is dead. I will wait for the plugin to be updated. youtube was working for me great. then after resaving the settings, i got the cannot log in error. Works fine on my other boxes, so do not touch your plugin settings if it works now. thank you berre, this works! a solution at last! Thank you, Berre. At last, something that actually works. Hopefully a new update will not mess it up. Thanks a lot for this... I was about to pull my hair out trying to log into YouTube on OpenElec (RaspberryPi). But VEVO videos are still giving script errors whenever I try to play them. I also keep getting the setting dialog again and again even when there is no username/password in the settings file. Any ideas why this might be happening? Don't know what's changed but when I enter the code into the html page I've created, it goes to https://accounts.google.com/o/oauth2/token I get a "HTTP 400 - Bad Request" error. When I open the html page, IE tells me that Active Content is blocked but I clicked on Allow Content to bypass the block.